I’ve been awfully political lately, here’s some lighthearted stuff to break the mood. 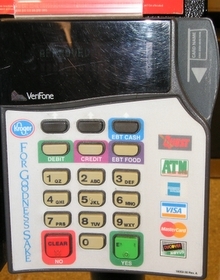 OK, you know those things that you use to pay with a credit/debit card at the grocery? This is one of the worst machines I’ve ever seen. I’ve used it well over one hundred times, and I still have to stop and read every button every time. Have you ever seen someone try to use it for the first time? You might as well be in line behind some who wants to pay by trading leftover kleenex — it’s gonna be a while. The sad part is that 95% of patrons are using it to do the exact same thing — pay with a card. How hard is that? The price comes up, you swipe your card, you push yes. How many buttons do you need? Two? They have over 20. A standard numeric keypad. 3 keys that change their function depending what point you are in the process. Another 3 or 6 with various payment options. It’s insane. Think about this device the next time you use it. Then tell me I’m wrong. Sadly, I feel just as strongly about this as I do the political material. There will be more posts on bad user interfaces in normal life. It drives me crazy. I actually spend time nodding my head while I read sites like this. Update: Here is a pic of the interface so you can see how ridiculous it is. I used to get mad at the administration for trying to manipulate people all the time. I don’t anymore. You can hardly blame them. Everyone would act this way if the media were so casual about letting them get away with it. But now we’re well beyond letting them get away and deep into aiding-and-abetting territoriy. The only difference between us is that I am still mad. Rice cooks the books to fake the terrorism isisn’t rising. Once again, the Bushies figure out a way to lie without technically lying. GWB is president because he lied and got away with it. Too many people believed the lies. Consider Iraq. Either you believe it was connected to 9/11 in some way or you don’t. If you do believe that Iraq has a connection to 9/11, then the invasion makes sense. And whatever bad things happen there are unfortunate, but neccessary to effectively take on the bad guys. On the other hand, if you think they are unrelated, then you think it was a gigantic mistake on ever level. Fact: Iraq has nothing to do with 9/11. There is no reputable independent source that will say otherwise. Fact: The Bush administration knew this, and decided to go to Iraq anyways, spreading lies to the American public. What did the exit polls show? 55% of the voters believed that Iraq was part of the war on terrorism, and the voted 81%-18% for Bush. Consider the WMDs. If you believed that Iraq had WMDs, and you believe that Sadaam was a nutjob who was unpredictable, then you might reasonably feel we had to do something about it. If you thought there were never WMDs and we had defanged Saddam back in Gulf War I, then you didn’t see what the all the fuss was about. Fact: Iraq did not have WMDs. They had close to zero offensive capability. We were more threatened by Australia then we were by Iraq. And Iraq and related issues were the #1 issue for voters, not “moral issues”. Of the 46% who bought into the fantasy that the Iraq War made the US more secure, 90% voted for Bush. Fact: The Bush taxcuts were bad economic policy, roundly denounced by hordes of economists. They were not designed to help the economy. Yet, 41% of the populace believed that they were even after 4 years of job losses and poor economic news, and they broke 92%-7% for Bush. So what do have here? We have a country were roughly half the people believe in fairy tales they’ve been told. In fact, as the article nicely demonstrates (and has been shown elsewhere), the majority of Bush supporters simply don’t know what the hell they’re talking about. 72% of Bush supporters continue to believe that Iraq had actual WMD (47%) or a major program for developing them (25%). Fifty-six percent assume that most experts believe Iraq had actual WMD and 57% also assume, incorrectly, that Duelfer concluded Iraq had at least a major WMD program. .. Similarly, 75% of Bush supporters continue to believe that Iraq was providing substantial support to al Qaeda, and 63% believe that clear evidence of this support has been found. Sixty percent of Bush supporters assume that this is also the conclusion of most experts, and 55% assume, incorrectly, that this was the conclusion of the 9/11 Commission. Here again, large majorities of Kerry supporters have exactly opposite perceptions…. only 31% of Bush supporters recognize that the majority of people in the world oppose the US having gone to war with Iraq. So are people idiots? Well, there’s never a shortage of idiots. But for the most part, that isn’t the answer, and it ain’t their fault. Citizens shouldn’t have to spend their time investigating to see if their leaders are telling the truth. I spend a lot of time diving through news sources, going to primary sources, reading informed commentary. Most people don’t. Most people shouldn’t. In a well-functioning democracy, there is no need to. Your leaders normally aren’t presumed to be liars, and a properly-functioning media will let you know when they are. We do not have a properly-functioning media. I will simply point you to 6 years of cites at The Daily Howler. Yep, GWB lied. He wasn’t called on it. Enough people believed. He won. He continues to lie. The US, and the world, is the worse for it.